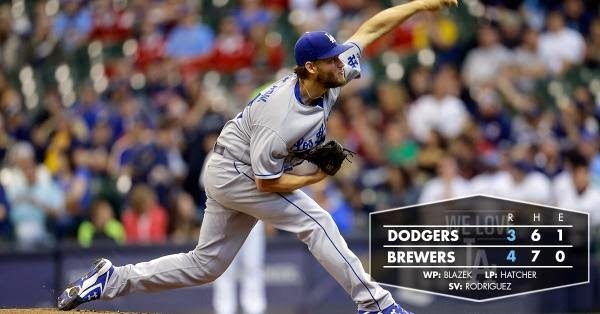 For seven innings Kershaw was brilliant. He had out-dueled Brewers pitcher Kyle Lohse but ran into some trouble in the eighth inning. Kershaw yielded a home run to rookie shortstop Hector Gomez and a double thereafter to Adam Lind to put the tying run in scoring position. "I don't feel like answering questions right now. I don't want to analyze it right now. Thanks." The times sure are changing for the better. Via Samer Kalaf at Deadspin, "Two Dudes Smooch On Dodgers' Kiss Cam, To Hearty Applause." It wasn't too long ago when two women were thrown out for doing the same thing. That guy who's riding his bike to every MLB stadium made it to LA on Sunday. Check out his blog post that tells you all about it. Via Matt Stolz at Biking for Baseball, "Welcome to LA." I did stumble upon Nomar Garciaparra and Orel Herscheiser. I actually overheard them talking with a Dodgers player and discussing different techniques they would use to gain an advantage. Orel spoke of purposely batting without batting gloves so he could claim the pine tar on his hands came from his previous at bat. Nomar spoke of how players would wear fake fingernails so they could better grip a baseball. It was pretty unbelievable, I felt like I was right in the clubhouse with the guys. The Los Angeles Dodgers today acquired right-handed pitcher Matt West from the Toronto Blue Jays in exchange for cash considerations and moved left-handed pitcher Hyun-Jin Ryu to the 60-day disabled list. West, 26, has allowed just one unearned run in 12.1 scoreless innings for the Blue Jays’ Double-A New Hampshire affiliate in the Eastern League this season. The Houston native also has one save and 17 strikeouts against just four walks in his seven appearances. Via Ron Cervenka at Think Blue LA, "Grandal admits he was hurt during first two weeks of season." Congrats to April NL Player of the Month Adrian Gonzalez and NL Rookie of the Month Alex Guerrero!